What Is Inbreeding in Dogs? 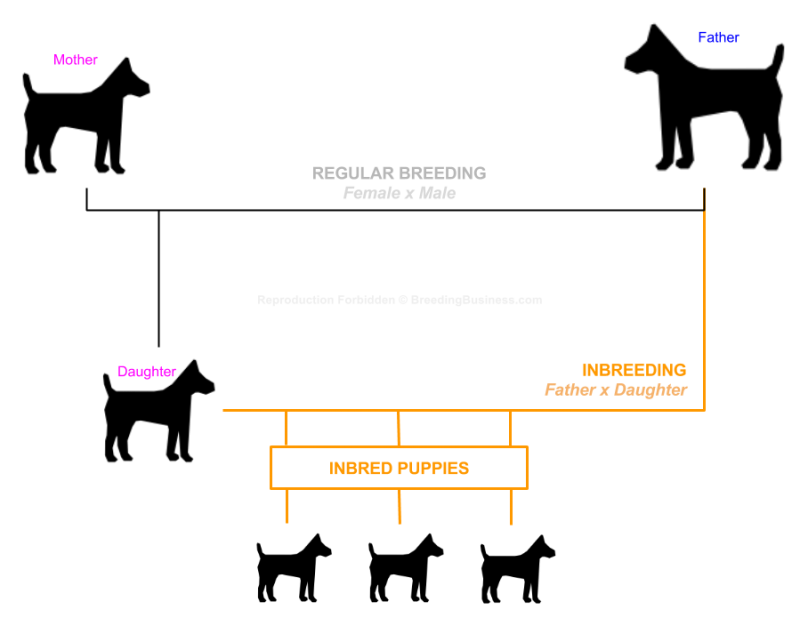 Why Do Dog Breeders Use Inbreeding and Linebreeding? The consequences of dog inbreeding, along with inbreeding depression, take several generations to be visible to us the general public. Therefore, for the first decades, inbreeding seems to be an ideal tool to create a new breed or perfect your own bloodline. Breed top champions with their own relatives over a few generations, and you then have consistently strong litters. But once these time-ticking bombs explode, you end up with stillbirths at every litter, adult dogs with inherited diseases, and you have to start all over again. Inbreeding and linebreeding in dogs is truly a double-edge sword: it is a very effective tool to produce high-quality specimens in a consistent way, but it also is a surefire way to pass on deleterious alleles. Eventually, a dog may be the perfect specimen for a given breed, but it may also embed several severe medical conditions, and boast a shorter lifespan. Dog inbreeding is the mating of dogs that are closely related. Examples include the mating of parent and offspring or the mating of siblings. Inbreeding results in individuals with very similar genes. Inbreeding dogs are how individual dog breeds came into being in the first place, and how many bloodlines are perfected. Modern dog breeds as we use the word today goes back to 19th century England when wealthy people invented the idea of conformation shows and breed standards. With each litter of puppies produced by inbreeding, the characteristic features and appearance of the breed became solidified. A dog with features not in conformity with the breed standard or that exhibited the presence of an unwanted characteristic would be culled for non-breeding purpose. Once the registries came into existence (the Kennel Club and the American Kennel Club being the first), all purebred dogs could trace their ancestry back to the initial founding stock. That is why some commentators will maintain that “purebred dog” and “inbred dog” are synonymous. Inbreeding and linebreeding help select the desirable traits in the offspring. Dog breeders use inbreeding to increase the odds of having puppies with desired traits. Many dog breeders want to have a puppy that has the traits in conformity with the breed standards. A dog that meets the breed standards is a dog that has a good chance in the show ring. pedigrees are more valuable with a number of champions in the bloodline. Breeders want to produce that perfect dog. With dogs, it is easy to see generations of the same dog at the time because dogs mate repeatedly and produce many offsprings in a lifespan. Dog breeders, in fact, many times own generations of offspring and can know what characteristics are lacking or strong in a particular dog and breed to offset or pass-on this quality to produce better puppies. These puppies then can be marketed to other breeders who are looking to do the same thing. The other reason a breeder may want to line-breed would be to increase the market value of a litter by giving that litter some good-on-paper heritage. In other words, the more championship dogs that appear in a pedigree the more valuable the dog will at least be on paper. Before the advent of the science of genetics this kind of assumption that the “apple doesn’t fall far from the (championship) tree” would be all a buyer could go on. Still, the truth is that all advertisements for a puppy are likely to state something about the number of championships in the bloodlines. Puppies with five championships in the bloodline can be marketed with higher price tags than puppies with maybe even better breed conformity and even better health but with no such pedigree. 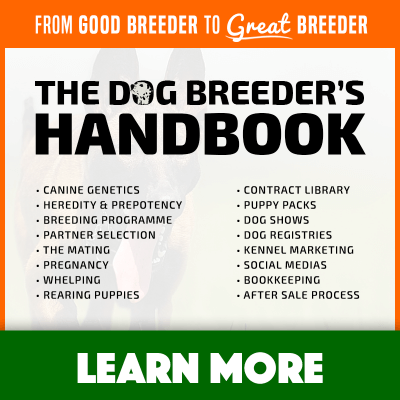 Unfortunately, ethical breeding would call into question any breeder with the knowledge now available about genetics breeding dogs using line breeding with solely this profit motive. Dog breeders have many other ways to be profitable so resorting to unwise practices is badly perceived. The coefficient of inbreeding is a mathematical calculation of probability. It represents the chance that a dog will inherit a homozygous pair of alleles from an ancestor on both sides of the pedigree, or that a given percentage of a dog’s genes will have homozygous genes (i.e. the same genes). A mating of full siblings will result in a COI of 25%; half siblings 12.5%, and first cousins 6.25%. The Kennel Club helps people do their math by providing a calculator for each breed based on its records of pedigree. A breeder need only put in a name or a registered dog and registered dam in order to get the COI. A dog has 19,000 genes set out in pairs of two. These genes are put together in pairs as strains and form the 39 chromosome pairs of a dog. Many bad diseases and unwanted traits that are not immediately expressed are recessive traits. Recessive traits must have homozygous alleles in order to be expressed. For example, the incurable disease degenerative myelopathy is inherited when a dog inherits from his carrier dam and his carrier sire the recessive genes from each. The coefficient of inbreeding tells a breeder how likely it is that one of these little time bombs will be in a puppy. The higher the coefficient of inbreeding the higher the chance and the greater the risk for both the puppy and the owner. On the flipside, the high coefficient of inbreeding also tells a breeder how likely it is that a breeding pair will produce a puppy of a certain color or have a certain height or have a more curly tail. It is literally a double-edged sword. Most commentators say a coefficient above 10% is too risky in terms of the health of the dog. Higher coefficients will be associated with a diminishing vitality in the dog, smaller litter size, and shorter lifespan (i.e. inbreeding depression). In order for the coefficient of inbreeding to be a good predictor, it is ideal to have the pedigree of the dog from the founding of the breed. The fewer generations inputted, the lower the coefficient will be and the less useful it will be as a predictor. A good benchmark is to be able to identify pedigree for at least five generations on both sides. 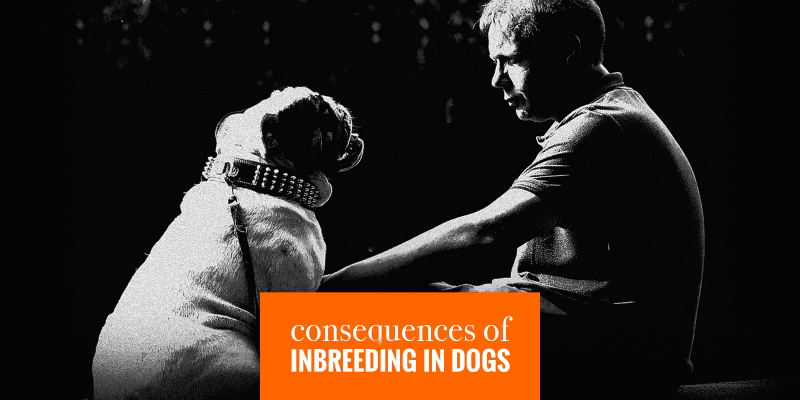 The consequences of inbreeding in dogs are manifold, and for most, they are lethal to dogs affected. The main problem with inbreeding is that the consequences take a while to be seen in a bloodline or a breeder’s breeding program. Indeed, many dogs will suffer later on as senior dogs, while some litters may have a higher ration of stillbirth. It’s difficult to figure it all out and pin it down as being a consequence of inbreeding, but it often is. Way before the science of genetics, it was noticed by the livestock breeders that too much inbreeding had a diminishing return in the vitality, fecundity, and mortality of the stock. Today, this phenomenon is called inbreeding depression. 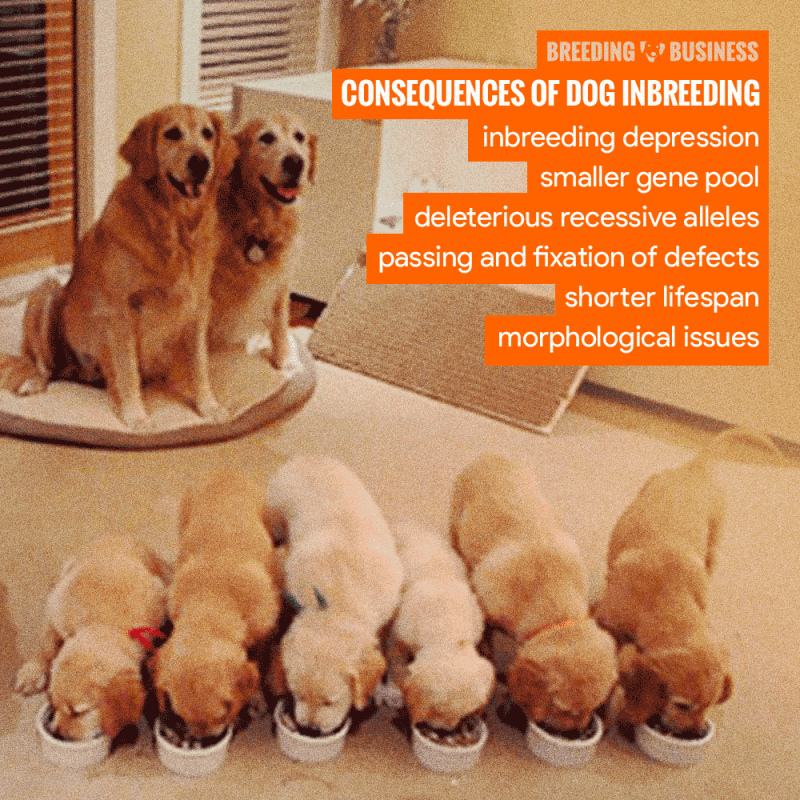 The benefits of inbreeding to acquire specific good traits comes with it a host of traits that make the inbreeding counterproductive for both the breeder and the dog. The reason inbreeding depression happens is because many negative characteristics of a dog (and other animals as well including humans) are expressed only when a dog has two alleles of a gene that are the same (i.e. homozygous). Many bad diseases and traits will only be expressed when there are two copies of recessive genes for the condition. The fatal and incurable disease of degenerative myelopathy is an example. The dog’s genome of 19,000 genes has been mapped, but how each of these individual genes is expressed is still an open question. Diversity in the genetic makeup of any individual dog or any breed makes a dog and a breed more likely to be stronger, more fertile, and more likely to live a long life. A smaller gene pool is the necessary consequence of having the great breeds we have today. Purebred dogs can only be registered as purebred if the sire and dam were also purebred and so on, with all dogs back to the first founding of the breed. Unfortunately, with the small gene pool comes the exacerbation of the deleterious impact of inbreeding depression especially over time. Purebred registries are not only small gene pools but also most of the time closed gene pools. For example, a puppy must have a sire and dam that are both registered by the Kennel Club in order for it to be Kennel Club registrable. This kind of protectionism, while understandable, keeps the gene pool closed from even the introduction of new blood from other countries that do have very respectable registries and healthy dogs. Commentators say an inbreeding coefficient over 10% is somewhat too risky. Refusal to recognize the pedigrees of dogs from different places means that not only is the gene pool artificially closed by the purebred registry itself, but it is also very limited in its geographic scope. A mutation for a new disease that crops up in a popular sire in London will be passed on to many, many offspring before it may even be discovered. Closed gene pools with circumscribed locales are doomsday scenarios waiting to happen. Dogs have over 600 genetic diseases. A cow has a little over 400, a cat over 300, and a goat less than 100. In wild animals, the comparisons become even more shocking. A gray wolf has six genetic disorders, and a coyote only three. The reason for this is because of the closed gene pool and the impact it has had in causing tremendous homozygosity in the genes of dogs. Dogs frequently will have two copies of an allele that is identical for a trait. Some very bad diseases in dogs are expressed only when a sire that has a recessive gene is mated with a dame that also is a carrier or when a dam is a carrier of an X-linked recessive gene. The impact on the litter of puppies can be tragic. For example, in the rare disease of Severe Combined Immunodeficiency, a dam will be perfectly healthy but will pass on to fifty percent of her puppies the X gene with the recessive gene for the disease. Male puppies with the recessive gene will be listless (i.e. having or showing little or no interest in anything), have diarrhea, and most likely die. Female puppies will be fine, but fifty percent of them will likely to be carriers, so this goes on and on over dozens of future generations. A serious cardiac disease in which there are four defects in the heart present is Tetralogy of Fallot and it occurs when a puppy gets one recessive gene from the dam and one from the sire. The disease causes the puppy to suffer from a continual lack of oxygen. For some diseases, it is possible to genetic test for before mating. Most notably degenerative myelopathy, progressive retinal atrophy, and von Willebrand’s disease have genetic testing available. Currently, there is no commercial genetics test for severe immunodeficiency disease. Other fatal diseases in dogs, especially forms of cancer, are suspected to be genetically inherited but the mechanisms are not yet understood. Inbreeding necessarily results in the passing on of some undesirable traits with the desirable ones. Dogs may be inbred for one characteristic but another is a tag along that gets fixed with it. There is no magic trick to only pass the good traits, and the leave the bad ones at the gates. Worst, you do not know at the time of the breeding how bad, the bad traits will happen to be in the future generations. For example, dogs bred to large or giant dogs with large girth, also, have a tendency to develop bloat and die from it than smaller dogs not bred to be oversized. Many of the endearing unique traits in dog breeds today are the result of homozygous recessive alleles being forever paired together in the future generations. Shorter lifespans are one of the elements found in inbreeding depression. Shorter lifespan goes beyond just the risk of anyone dog having a genetic disease that ends its life. In general, inbreeding makes dogs more susceptible to getting sick. The weakening of the immune system (which is wrapped up in an overall loss of vitality) makes it likely that dogs succumb to a host of non-genetic illnesses as well. Therefore, it is hard to know how strong the relationship is between the inbreeding coefficient of a given dog and its cause of death. Simply because a high coefficient of inbreeding implies a loss in vitality for the dog, resulting in a weak immune system, making it a potential victim to so many diseases that are not inherited. Poor maligned dog breeders—from reading social media they must really hate dogs. The truth is that it was the zeal and overriding love of the dog that made so many people invest so much in them, to begin with, and create all these breeds that fill so many different roles for people today. Dog lovers hate to see their beloved animals suffer. The plight of the English bulldog is one where there is an intense conflict of love for this delightful unique breed and how much suffering breeding should permit. The damage in the breed’s creation was done over a century ago so to pass a law preventing the breeding of any brachycephalic dogs (and there are people who do want that law) and completely ending the breed in some places (ironically more likely to happen in England than the United States) would be a tremendous loss to many who love it. This topic is for a different article, but safe to say there is a dearth of positive articles on purebred dogs or their breeders. Other unknown genetic tag-alongs breeders just can’t know because not even the scientists know them. The genetics of a dog is an ongoing investigation. It may be found tomorrow that an extra straight tail on a Dalmatian is somehow genetically linked to the occurrence of hip dysplasia in the breed. These kinds of problems sometimes take human generations to become apparent, but hopefully, it won’t be too late for the given breed and its specimens.